Full and partial buyouts are available. We offer customized food & beverage menus for buffets, kamayan, stationed appetizers and passed bites menus, full staffing, an indoor-outdoor sound system including wireless microphone. Let us help you coordinate all aspects of your event including entertainment (DJs, bands, etc) and décor. For more information, click the button below, email info@mestizasf.com or call 415-655-9187. 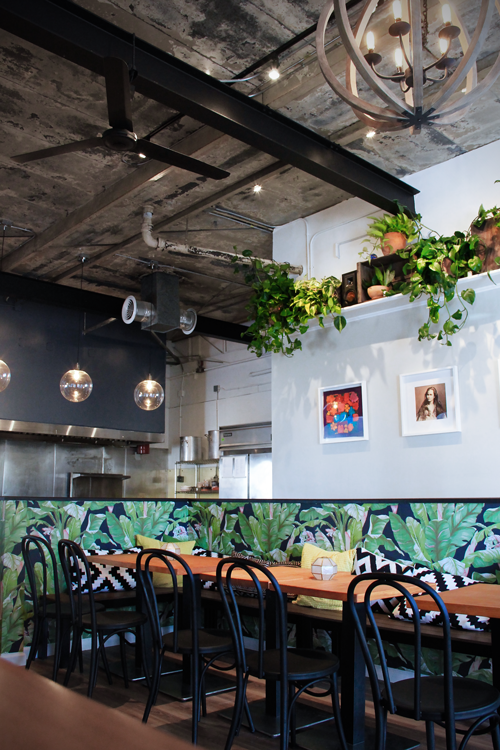 A patio oasis hidden from the hustle and bustle of San Francisco with tropical plants, live edge wood tables overlooked by a striking floral mural by SF artist Jet Martinez. Complete with outdoor sound system and charming string lights, the patio at Mestiza is a space that your friends, family, or team members will remember for any special occasion. Patio heaters and umbrellas are available upon request. A tropical escape from the City in the heart of SOMA with live plants dangling from shelves below a high, exposed concrete ceiling. Seating includes a beautiful, pillow-decked banquette covered in banana leaf wallpaper, chairs and benches. Mission-style arched walls separate the bar and kitchen from dining area. The space is finished with pieces from Mexico, Philippines, Cambodia and Thailand. Mestiza's interior is a perfect space for seated dinners and cocktail parties alike. Bookings include use of the sound system and wireless microphone.